Detail : George's fifteenth solo single, and second taken from the "Somewhere In England" album. The single was released in a picture sleeve, but still failed to chart. 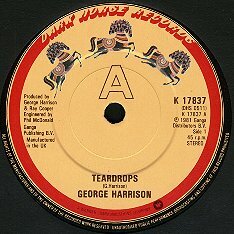 "Teardrops" was one of the four new tracks presented to Warner Brothers after they vetoed four of the original tracks meant for the album (full story when I enter the L.P. details).